Happy birthday Fidenza Village! To celebrate the 15th anniversary of its opening, the Village has been given a makeover, with a special focus on its exterior area. The mainstreet, indeed, is subject to a new set-up aimed at recreating an ideal journey through the Bel Paese, as if guests where enjoying a Grand Tour of Italy. 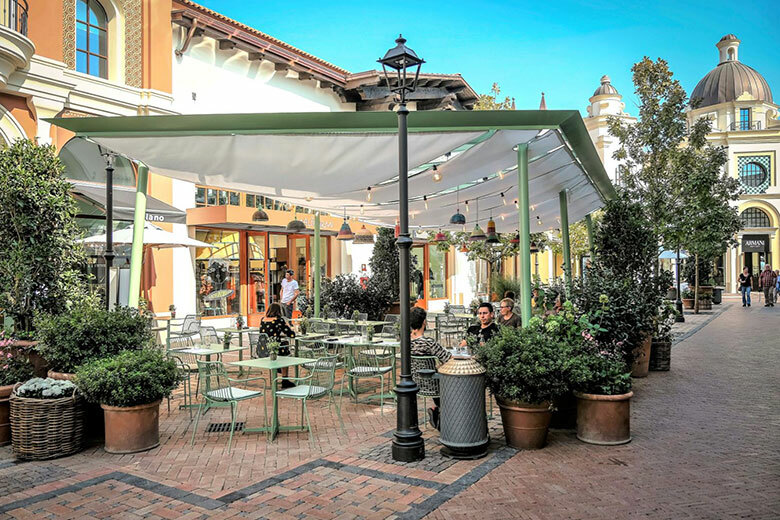 Following a project by Vudafieri-Saverino Partners architecture studio, stores and restaurants are set alongside a central alley, featuring gazebos and terraces to recretate the typical atmosphere of an Italian piazza (the Italian word for square). Besides architectural updates, Fidenza Village has also enriched its offer with the introduction of special tourist packages. With a minimum purchase at the Village, guests can take advantage of a tour to the Museo Ferrari in Maranello and to the Museo Enzo Ferrari in Modena, two unmissable destinations for motoring enthusiasts, plus other dedicated benefits. Those who don’t enjoy the world of the engines, though, can take advantage of exclusive partnerships between Fidenza Village and relevant museums and institutions in northern Italy. Top destinations include: the Verdi Museum and the Violin Museum in the city of Cremona, Museo Teatrale de La Scala in Milan, but also a hot air balloon tours over the Castelli del Ducato, aperitivos within wine cellars and tastings of the local speciality of Culatello di Zibello, as well as guided tours of the laboratories where Parmigiano Reggiano cheese and Parma ham are made. As part of a development project aimed at turning Fidenza Village into a reference point for tourism, besides for shopping and fine dining, the Village also offeres its guests the chance to book customised offers which include guided tours to the Cathedral and Baptistry of Parma, the Via Francigena, the Reggia di Colorno, the Duomo in Fidenza, the Poldi Pezzoli Museum in Milan, as well as the Last Supper, the Masone Labyrinth nearby the Village and the Casa Pavarotti Museum. Good news also for those who wish to indulge in a moment of relaxation, as the custom-made options also include a day at the thermal SPAs in Milan or Salsomaggiore, as wel as a golf day at the 18-hole course of the Salsomaggiore Golf Club. Fidenza Village can be reached by the Shoppping Express shuttle bus powered by Open Tour Milan.